We Can be reached via email:click here. Welcome to the beginning of the revival of real bread in Baltimore. When you go out to an eating establishment for a sandwich what sort of bread do you get? Is it soft, crust less and undistinguished? These days when we find ourselves paying $6-$9 for a sandwich it is an outrage that the bread is not properly baked. We at BRBRP believe that real bread should come out of an oven and not out of a plastic bag! The failure of bread in Baltimore should be addressed by state and local governments and by individuals volunteering to help eating establishments re-discover proper bread. With appropriate governmental tax relief and grants these goals can be easily accomplished with no extra cost passed on to the consumer. Once bread has been revived Baltimore will become a magnet for tourism, conferences, new residents and new businesses. It will come to life! Well Risen Real Bread is as important to the city as high rise hotels! To learn more go to our main menu click here. a sign of an open grave. Never break cornbread from both ends. next day is sure to be fair. down, or to cut an unbaked loaf. cut bread on baking day. knife. Will never be happy maid or wife." will be better for your batch." to let the devil out. Bread won't rise if a corpse is nearby. devil will fly over the house. as that of her husband-good for cures. into the oven-steam jets etc. on the bottom of the oven. after they begin to color. or loaf placed too low in the oven. covered by foil or paper. Our Goals and Objectives-What is Real Bread? 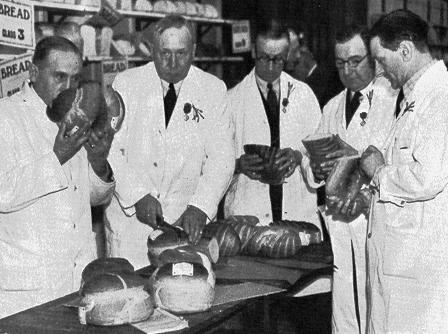 The Baltimore Real Bread Restoration Project seeks to restore real bread which is appropriate to its setting to Baltimore. We wish to focus regional and local governmental concern upon this goal. It will be important to recognize establishments which currently produce and serve real bread appropriately. 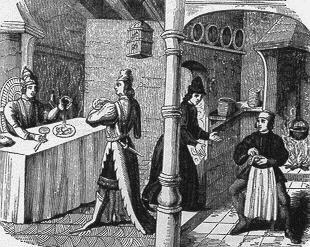 We shall also foster the exchange of information between individuals, bread producers and eating establishments which will assist in the restoration of Real Bread to the eateries and bakeries of Baltimore. We do not attempt to advertise for any company. Our purpose is only to identify and characterize. 1.The recipe selected must be followed properly and the product should be cared for so that the bread reaches the consumer with its essential characteristics intact. of relationship between bread and meal or food must dominate. This global tradition is not a single recipe but a number of variations in an acceptable range which produce an acceptable product. Of course you may offer a selection of breads! However, your selections must be real and appropriate. The bread representing the global tradition should be available. Places that serve "Real Bread"
Send a donation to the webmaster to keep these pages and this project going- Note we are not a non-profit we however operate on an at cost in-kind basis. Where has Real Bread Survived in Baltimore? Does Baltimore have its own Bread? Send in your suggestions: Bakeries,Eateries,Stores. Businesses listed below arelisted for information purposes only. We accept no advertisements and we will list any establishment which provides Real Bread only after we have tested it. We do not wish to sell products, however if you find your favorite eatery trying to pass off poorly made bread from plastic bags- we would suggest that you pass on to them the names below in the hope that they might improve their offerings in the future. Editor's Note- imho...profit taking when it comes to simple, inexpensive to produce bread is an outrage. Uptown's prices are quite steep. The product is desirable but no one should turn bread water salt and yeast into such a high cost item. Unfortunately I highly disagree with you that Uptown Bakers is "Artisan Bread". Maybe when the company first started. Now that it is under owner Mike McCloud, the company has become the equivalent of Godzilla in the guise of the Pillsbury Doughboy. They are a 10 million dollar a year operation, have been sued for discrimination, churn out 30,000 loaves a day, and have just entered into an agreement to add bar codes to their plastic bagged loaves in a big expansion effort to move into Pennsylvania supermarkets. Not that there is anything wrong with pursuing corporate expansion and profits, but I would hardly call their product "artisan" It is mass produced on a scale larger than any other bakery in the area. Send in your suggestions, Include a phone number. Bailley, Adrian, The Blessings of Bread, Paddington Press, New York and London,1975. 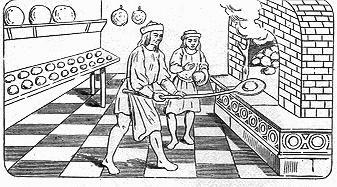 A good history of breads and good ethnic recipes. Several books which pay attention to good bread take your pick. Time Life Books, Foods of the World. A series of volumes on regional Quisines which pays attention to real bread. Malgieri, Nick How To Bake.,Harper Collins,N.Y. 1995. Johnson, Ellen Foscue, The Garden Way Bread Book, A Baker's Almanac.,Garden Way, Charlotte,Vermont.1979. 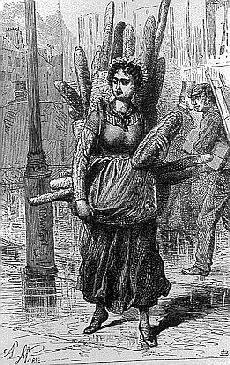 Elizabeth David, English Bread and Yeast Cookery, Viking Press, New York. Intro and Notes for the American Cook by Karen Hess. I will not complain unless I can provide a solution! So see below. Print them out and give them to your eatery chef or local bakery! Spread the word. Maybe they have lost their recipe or just don't know better! These recipies have been tested and they produce great Real bread. Just work on it- Breadmaking takes practice! For best results hand slice bread as needed a slice at a time. Store in a paper back and refresh crust in oven. Beat in 1 cup rye flour with brown sugar/water mixture. Let stand at room temperature for 24 hours. Repeat previous procedure again. Let stand another 24 hours. and 2 tablespoons of brown sugar for each cup of sour you have taken. The dough should be dense. Allow to rise for 3/4 hour. Punch down, put on floured workboard, cut in half and make each half into a loaf, round or longas you prefer. Place on baking sheet prepared with corn meal. Allow to rise for 45 minutes. before putting the bread in the oven , pour 1 cup of hot water into the pre-heated pan. approximately 40 minutes or until done. This cooking time is for a non-convection oven. 2 cups unbleached all-purpose flour. Yields one large 9-10 inch round loaf. 1. Sponge: Place the water in a large mixing bowl and whisk in the starter. Stir in the flour then put the bowl into a large plastic bag and let the sponge to rise at room temperature for at least 8 hours or overnight. cups of flour and the salt. Knead by hand to form a smooth elastic, and slightly sticky dough, about 5 minutes. Incorporate the remaining flour, a tablespoon at a time, If the dough is too soft. In a Food Processor, put the sponge, 1 1/2 cups of flour, and the salt in a work bowl fitted with a metal blade. Pulse repeatedly until the dough forms a ball (if the dough will not form a ball, add the remaining flour, a tablespoon at a time, and pulse until the dough forms a ball.). Let the dough rest for 5 minutes, then let the machine run continuously for 20 seconds. place the sponge, 1 1/2 cups of flour, and the salt in the bowl and mix on loeed to form a smooth, elastic, and slightly sticky dough- 5 minutes. Incorporate the remaining flour, a tablespoon at a time, if the dough is too soft. 3. Place the dough in an oiled bowl. Turn the dough over so that the top is oiled. Cover with plasic wrap and let to rise at room temperatuere until doubled, about 1 hour. 4. Put dough on floured work surface and press to deflate. Form into an even sphere by tucking the sides under at the bottom of the loaf all around. Invert the loaf into a round basket lined with a heavily floured towel or napkin so the tucked under part is on top. Cover the basket with plastic and allow the dough to rise until doubled, about 1 hour. 5. About 30 minutes before you intend to bake the loaf, set racks at the middle and lowest levels of the oven and preheat to 500 degrees. Place a baking stone or cookie sheet on the middle rack. Set a pan on the lowest rack to absrob some of the excdss bottom heat. This will keep the loaf from burning on the bottom. 6. Invert the risen loaf onto a cardboard , a peel or a cookie sheet covered with cornmeal. Hold a razor blade at a 90 degree angle to the top of the loaf and use it to slash a diagonal lattice pattern on the loaf. Slide the loaf onto the stone or heated sheet pan and quickly close the oven. Lower the temperature to 450 degres. If you wish, throw a cup of hot water onto the pan in the bottom of the oven to create steam which will help the loaf to rise and to crisp its crust. 7. After the loaf has baked for 20 minutes and is completely risen, lower the temperature to 350 degrees and continue baking for 20 to 30 minutes longer, until the bread is well risen and a dark golden color. It should reach an internal temperature of about 210 degres. 8. Remove the loaf from the oven and cool on a rack. Send in your favorites. Our test kitchens are ready! How can we better accomplish our goals and objectives-let us know!